FOR: All current Apex members who have attended the companion online training and/or have completed the prior level outdoor training, or have appropriate experience on their MAA profile. 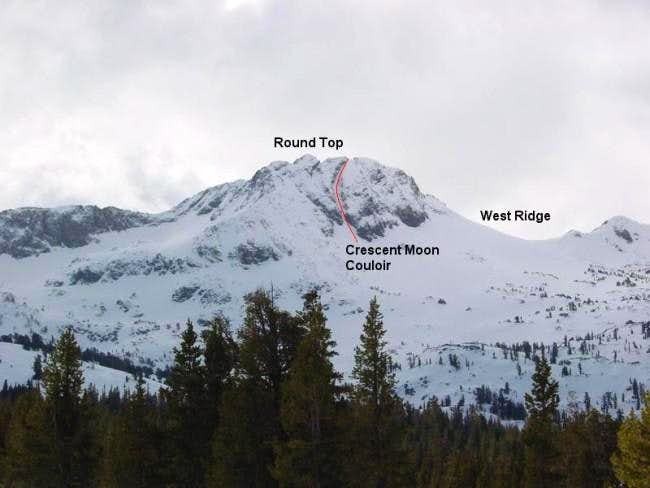 Join MAA members on Round Top to climb the Crescent Moon Couloir. This moderate snow climb takes a interesting curving line right up the north face of 10,381 Round Top. 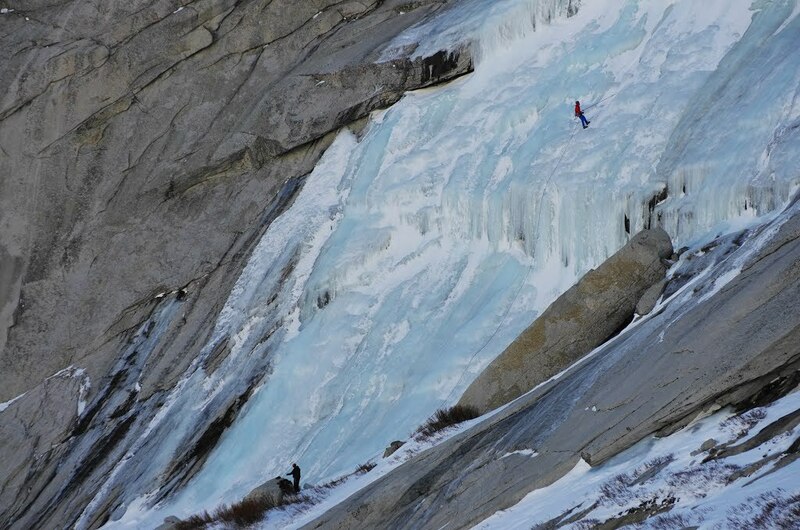 Proficiency climbing steep snow / alpine ice in a rope team is required (Snow 3 and 4). Loaner gear may be available. We have room for 6. Hope to have you out with us! What's happening: Round Top on highway 88 Carson Pass near Tahoe, climbing the Crescent Moon Colouir, moderate and steep snow. Simul-climbing in teams of 3 or 4, placing intermediate protection. 3 mile approach (to base of route at Winnemuca Lake), 1,800 feet total elevation gain to summit. Walk off the west ridge. Where to meet: Carson Pass Sno-Park trailhead 7:30 am. What to bring: Mountain boots, crampons, mountain axe and second tool, harness, belay device, prusik, 48" sling or runner, PAS, 3 locking carabiners, layered clothing, climbing pack, trekking pole(s), food, water, personal items, 10 essentials. 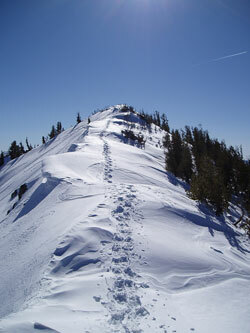 RELAY PEAK SNOWSHOE HIKE: All levels welcome on this snowshoe hike to to Relay Peak overlooking Lake Tahoe from the Mt. Rose Trailhead. This peak is in NE corner of Tahoe and has great views of Reno and the Tahoe backcountry. Some previous hiking experience recommended. Loaner gear may be availalbe. We have room for 8. Hope to have you out with us! Route: Out/back is 9.4 miles round-trip with 1,515 ft of elevation gain. Where to meet: April 20th, 8:00 am. We will meet at the Mt. Rose Trailhead Parking lot (at the summit of the Mt. Rose Highway). From Sacramento - Take HWY 80 to Truckee and take the HWY 267 south exit. At Kings Beach, turn left onto HWY 28 (East towards Reno). At the roundabout, follow signs for Reno onto HWY 431 until you reach the summit pass. You will see the Mt. Rose Trail Head on the left (large parking area with a restroom building). From Reno: Take the Mt. Rose Highway (431) to the summit pass. Trailhead will be on the right. We will meet at the Mt. Rose Trailhead at 8:00 am. From there we will do quick introductions and then hit the trail. It’s a gradual ascent up the fireroad and we will take periodic breaks to shed layers, hydrate, and have snacks before reaching the summit of Relay Peak. Depending on the weather, we will have our pack lunch at the summit and then return to the trailhead. From there, depending on the groups timeline we can head into Reno or Incline for a group celebratory lunch/early dinner and head out from there. Join MAA at Consumnes River Gorge for a day of top-rope rock climbing. All levels are welcome. Bring your gear and belay skills for a fun day out at this scenic area. We have room for 8. Hope to have you out with us! 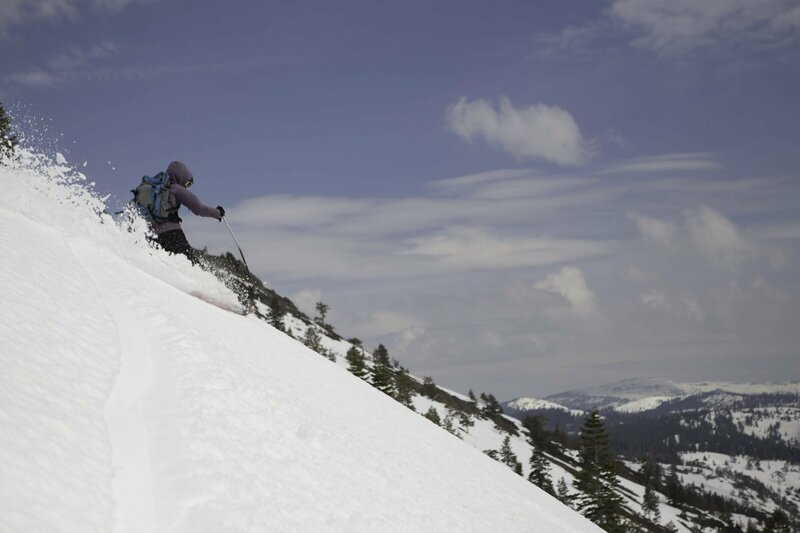 Join MAA members at Rubicon Peak in Tahoe for some amazing backcountry skiing. This is one of the most accessible and popular skiing destinations on the west shore, with a variety of terrain and incredible views of Lake Tahoe. Current Avalanche 1 training and avy gear required to attend. We have room for 8. Hope to have you out with us! What's happening: Backcountry skiing on Rubicon Peak, 9,183, laps on bowls and faces with tree cover. Join MAA members at Mt. Dana Couloir for ski mountaineering. This is an ascent and ski descent of couloir with a steep line and a long approach since Hwy 120 will most likely be closed. Avalanche skills required. SCREENED EVENT: Please join the waitlist. Attendees will be selected based on skill proficiency and experience shown on MAA profile. Those registered will be notified. Location: Dana Couloir is a steep couloir on the south east side of Mount Dana about 500 feet below the summit and is located just outside Yosemite NP on Tioga Road, west of Lee Vining on HWY 395. Route: From Lee Vining, turn west on HWY 120 to the road closure gate about 2 miles up the road. From there, it is about 8-9 miles up a long, gradual incline to Tioga Lake. From there, we will take the easier trail from the entrance station up the northwest side of Dana to the summit and then drop down to the Couloir. Our descent route will be out through the drainage to Tioga lake and then back down the road. 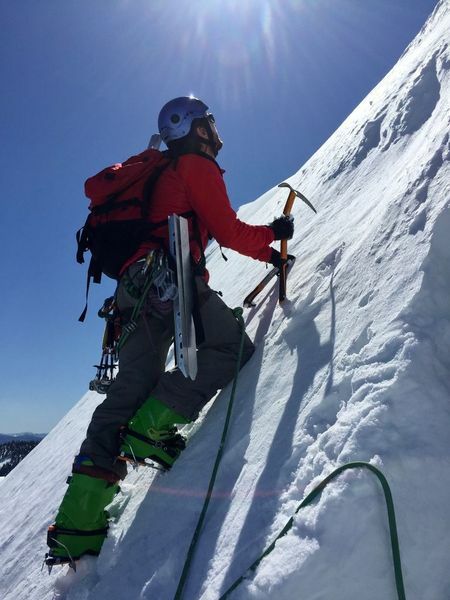 Skills Requirements: In order to be best prepared to climb safely and effectively, participants should have advanced skiing skills with the ability to link turns in the fall line in wild snow conditions. They should be comfortable and in control in advanced terrain (black diamond off-piste ski trail rating). The couloir is steep with other seen and unseen hazards. All participants must be AIARE Avalanche Level 1 certified and be proficient in snow climbing and winter camping. If anyone requires additional assistance in planning, I will be more than happy to help you prepare for the trip. Personal Gear: Members are encouraged to use your own equipment. If you’re missing something, club loaner gear may be available (except footwear). Please let the event leader know if you need something. Getting There: Take HWY 395 to HWY 120, Tioga Pass, at Lee Vining and turn west. Park at the road closure gate. Rideshare from Sacramento is available Friday evening, will coordinate further over email. Accommodations and Food: We will be winter camping, and packing in our food and packing out our trash. Bring food with lots of calories and snacks. Also have a stove and fuel to melt snow for water. There might be running water available depending on conditions. Emergencies: Always dial 911. Mammoth Hospital, 85 Sierra Park Rd, Mammoth Lakes, CA 93546 (701) 934-3311. Mono SAR (760) 914-4669. I have WFA certification and will have an InReach satellite communicator for emergencies (life, limb, eyesight). Make sure you have fresh batteries for your beacon and know how to use your equipment. Day 0: Friday, April 26th – I will be at the meet up location Friday evening and camping in the field. Day 1: Saturday, April 27th – We will get started at 8:00 am to organize gear and go over group details, discuss the avalanche forecast, backcountry hazards and complete a beacon safety check. We will hit the trail around 9:00 am and hopefully be at Tioga Lake before night fall. We will camp here for the night. Day 2: Sunday, April 28th – After breakfast we will ascend Mount Dana to the summit and then drop down the south side to ski the couloir one at a time watching for changing conditions. Once down the couloir, we will head down the drainage back to Tioga Lake and then down the road back to the cars. We will probably grab dinner in Lee Vining before driving home. 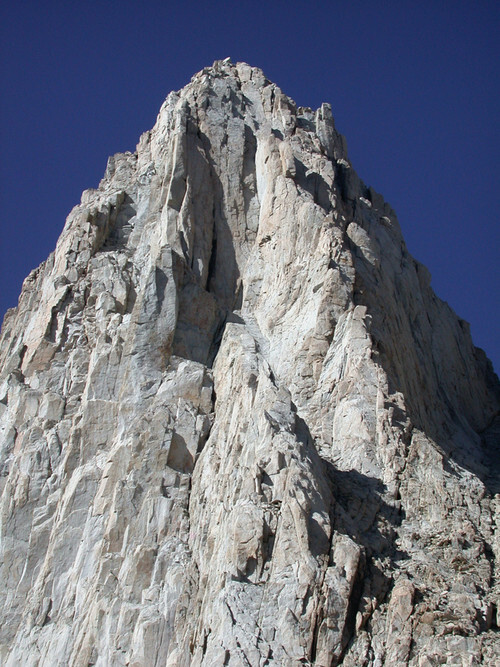 Join MAA to climb the Sierra classic East Buttress route on Mt. Whitney. This is one of the best moderate alpine rock routes anywhere. We'll be going early season, expect snow on the route and the approach / descent. Participants will need to be experienced multi-pitch alpine trad leaders. Loaner gear may be available. We have room for up to three teams. Hope to have you out with us! 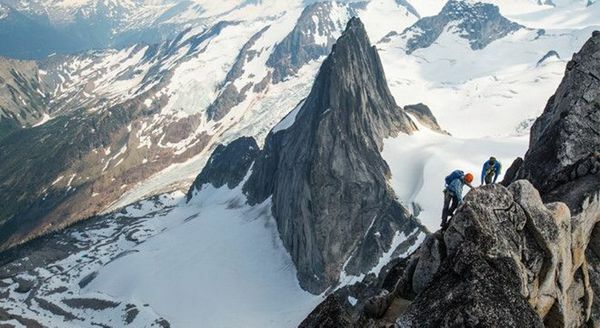 EXPEDITION TRAINING: Confirmed members of the Bugaboos 2019 Expedition team will have priority RSVP on this date. Where to meet: Mt. Whitney campground or town of Lone Pine, TBD. We may collect a registration deposit to secure this ahead of time. Event Leaders: Darren Shutt, 916-872-3399, darren@mountainascent.org, and Aaron Howse. What to bring: Rock climbing shoes, harness, helmet, belay device, 4 locking carabiners, slings, cordelette, prusik, crampons, ice axe, 15-30 liter climbing pack, approach shoes / boots compatible with your crampons, food, water, sleeping pad, sleeping bag, headlamp, trekking pole(s). Group gear such as rock protection, ropes, tents, stove, etc. will be decided at the trailhead. If you have something you can share please bring it. Refund policy: Full refunds allowed outside of 30 days from the event, no refunds possible closer than 30 days. DAY 1, Friday, April 26th: Meet at Whitney Portal campground in the late afternoon. Logistics. DAY 2, Saturday, April 27th: Ascend north fork of Lone Pine creek trail to Basecamp at Upper Boy Scout Lake or Iceberg Lake. DAY 3, Sunday, April 28th: Early start, climb route. Descend Mountaineer's route to basecamp, and continue back to trailhead. 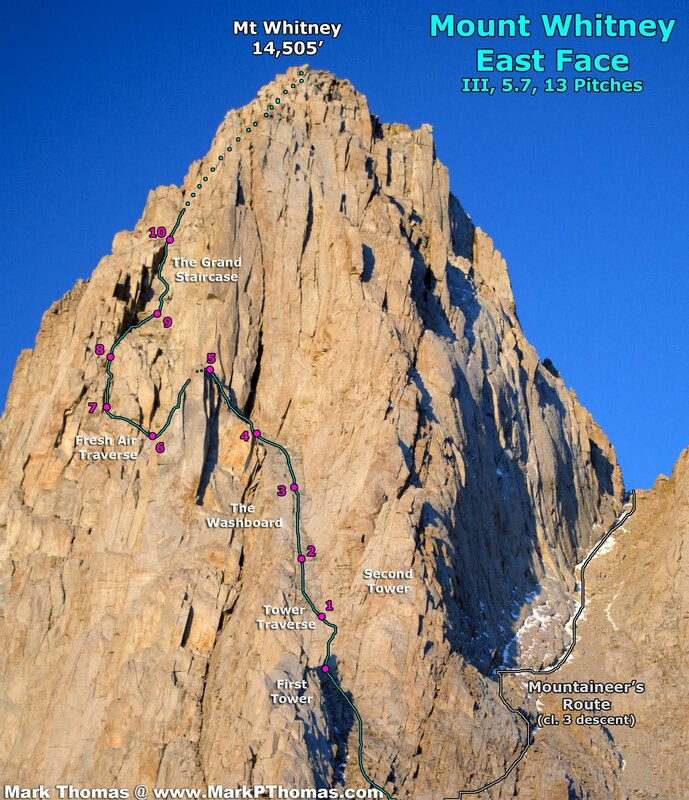 Join MAA to climb the Sierra classic East Face route on Mt. Whitney. This is moderate alpine rock route wows climbers with the incredible exposure and adventurous traversing. We'll be going early season, expect snow on the route and the approach / descent. 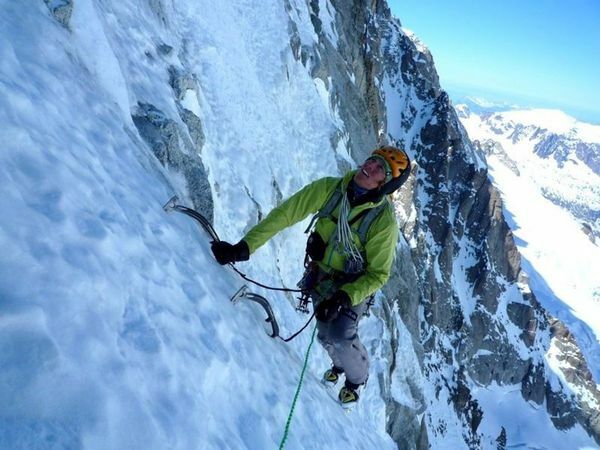 Participants will need to be experienced multi-pitch alpine trad leaders. Loaner gear may be available. Hope to have you out with us! DAY 1, Friday April 26th: Meet at Whitney Portal campground in the late afternoon with the East Buttress team. Logistics. 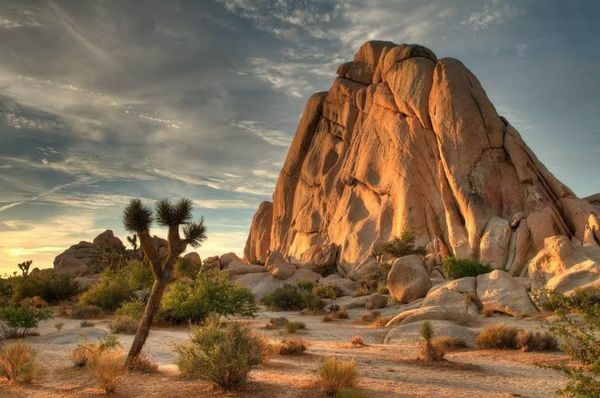 Join MAA at Corpse Wall in So Cal for a day of top-rope rock climbing. All levels are welcome. Bring your gear and belay skills for a fun spring day out at this scenic area. We have room for 8. Hope to have you out with us! What's happening: Top rope crag climbing on Corpse Wall, easy 5th class to 5.9. This is a north facing sandstone and conglomerate bolted sport crag with some trad routes. 23 routes from which to choose. Where to meet: Corpse Wall is near the crest of the Santa Monica Mountains. Park at the intersection of Stunt Road, Saddle Peak Road and Schueren Road hike up the Backbone trail to the west (towards water tower). The slabs are an obvious formation approximately 3/4 mile up the trail. The trail climbs for the first 1/2 mile and then descends slightly to the climbs - main wall to the left of the trail. Join a nationally certified MAA instructor for a live training con call. Everyone is invited to join in the discussion and Q & A on that week's topic. Please come prepared with having watched the corresponding online training videos. Everyone is invited to attend and bring your experience, thoughts and questions! Join MAA on Donner Summit for a day of top rope climbing on amazing Tahoe Granite. 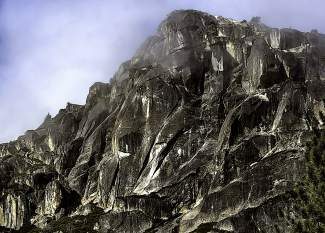 These scenic crags feature crack, slab and face climbing all close to I-80. We'll be climbing at Green Phantom, right there at the bridge. A wide range of climbing is available, with all levels welcome. Ideal participants can belay safely and tie in. Loaner gear may be available. We have room for up to 8. Hope to have you out with us! Where to meet: 8:30 am at the Donner Lake overlook parking area, at the historic curved bridge, on the east side of Historic Donner Pass. This is just beyond the entrance to Sugarbowl ski area. Take Exit 174 from Interstate 80 or drive up old Lincoln Highway from Truckee. 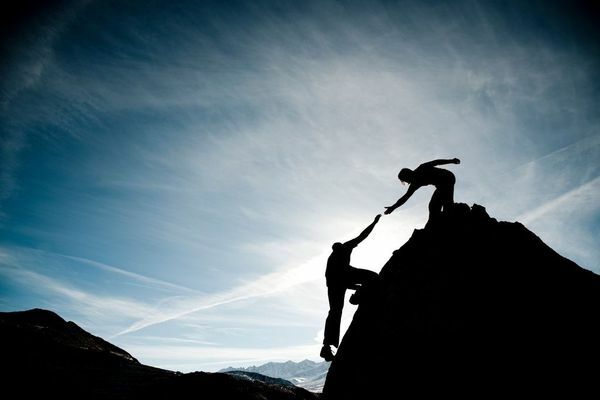 Join MAA on Mt. Shasta for an ascent of the scenic West Face route. This route is equal to the Avy Gulch route without all the crowds. We'll climb the route over two days, with a contingency day built in. Loaner gear may be available. We have room for 8 members. Hope to have you out with us! What's happening: West Face route, from Bunny Flat 6,800'. to summit 14,179'. Moderate snow, 45 degrees max. What to bring: Warm, stormproof layers for upper and lower body - 4 layers for upper and 3 layers for lower, minimum. 2 pair socks and gloves, warm mittens, warm headwear, headlamp, sunglasses, goggles, gaiters. 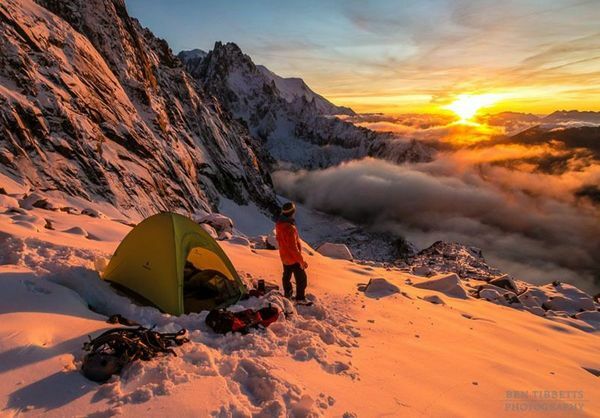 Harness, helmet, warm mountain boots, sharp steel crampons fit to your boots, mountain axe with leash or runner to connect to harness, food for 2 nights / 3 days, waterbottles, spoon, cup, warm sleeping bag, 2 sleeping pads, trekking pole(s), snow shovel. Stove, pots, fuel and tents may be supplied by MAA. Bring what you have of these items and we'll select the group gear. Plan for about 10 liters of space and up to 10 lbs for group gear. Additional Info: Event may be altered or cancelled by weather, even at short notice. DAY 1. May 3rd: Meet at Bunny Flat at 8:00 am. Sort gear, make plans, pack. Head toward Horse Camp, after 2 miles take left branch into Hidden Valley. Continue around the base of the mountain another 1.5 miles and set up camp, approx. 9,200. DAY 2. 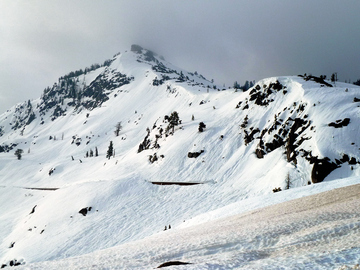 May 4th: With an early start, ascend straight up the West Face Gully, keeping Casaval Ridge on the right, and veering slightly left until topping out at the base of Misery Hill. Continue up with Whitney Glacier on the left until reaching the upper plateau. Cross the flats and ascend the summit castle. Descend the same route. DAY 3. May 5th: Break camp or head home. Or contingency date for weather. Join a nationally certified MAA instructor live online for a conference call. Everyone is invited to join in the 30 minute discussion and Q & A on the topic. The training presentation will be briefly reviewed. If you are a paid member please view the corresponding online training videos prior. This training discussion will review and answer questions about the knowledge and skills in MTN 3 - please watch the training video beforehand. MEET: Bassett Station, Hwy 49, west of Sierraville, CA. You must be a Base, Peak or Apex Member to attend MAA events. Join a nationally certified MAA instructor live online for a video conference call. Everyone is invited to join in the 30 minute discussion and Q & A on the topic. The training presentation will be briefly reviewed. If you are a paid member please view the corresponding online training videos prior. This training discussion will review and answer questions about the knowledge and skills in ICE-R Glacier Travel and Crevasse Rescue (formerly SIG 3.4) - please watch the training video beforehand. The Monthly Event Leader Conference of the Mountain Ascent Association will be held the second Tuesday of each month from 8:30 - 9:30 pm. The meeting will be held online and a link to the call will be sent in the confirmation email (see below). All ELs are requested to attend, guests are welcome. Call will be recorded for those who cannot attend. 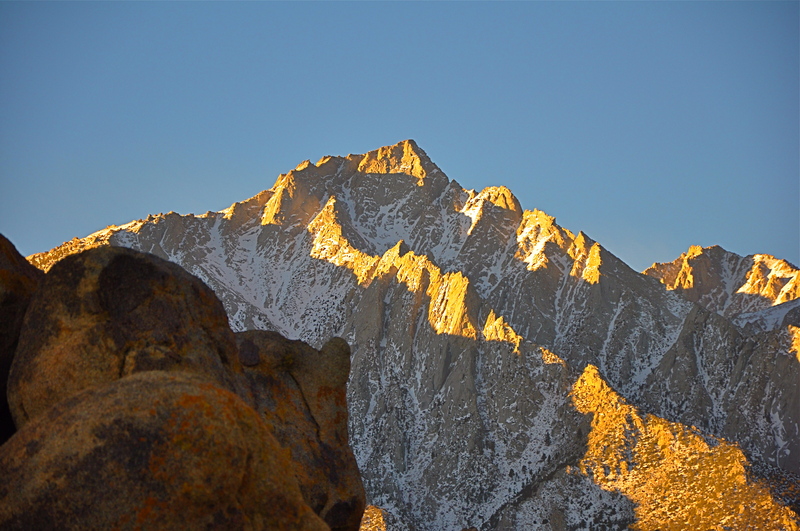 Join MAA on Lone Pine Peak to climb the long and stunning North Ridge. 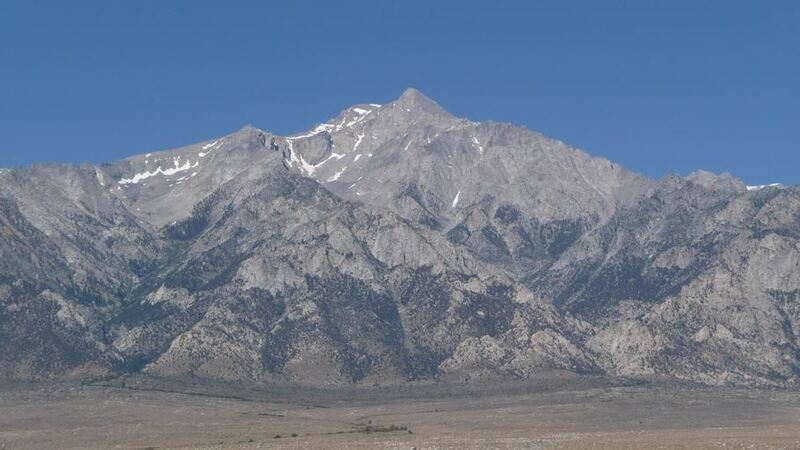 This is an adventurous ridge climb with a commanding view of the Owens Valley and the Whitney area. Proficiency at multi-pitch alpine rock climbing required. Loaner gear may be available. We have room for 4. Hope to have you out with us! What's happening: Lone Pine Peak 12,944', North Ridge III, 5.5. In early season we may be dealing with some snow. 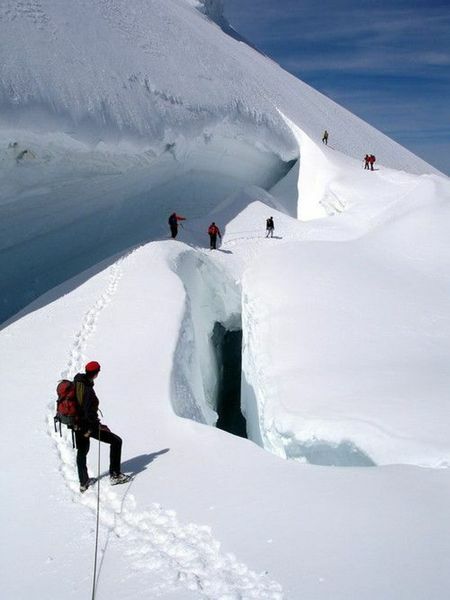 Even though it is an easy climb, the length, routefinding, and altitude make it a long and strenuous climb. Those attempting need to be in excellent shape and comfortable moving quickly without protection while scrambling with a pack at altitude. 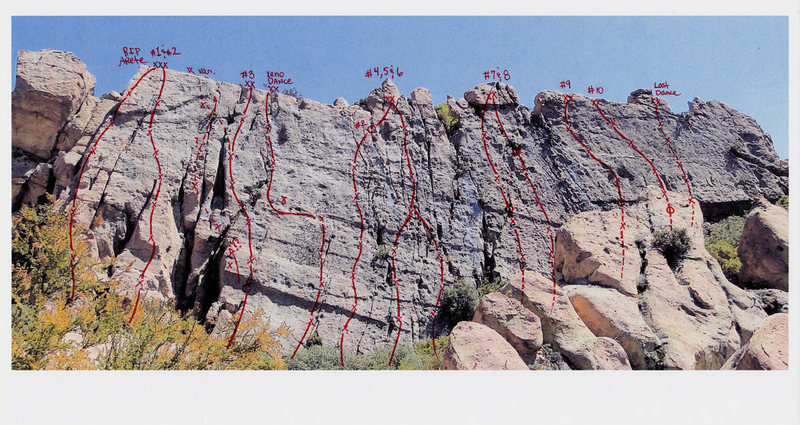 It is imperative that the route is climbed quickly, so most of the time we'll be using a running belay. There is also a few pitches to lead traditionally, and some 3rd class and 4th class downclimbing. 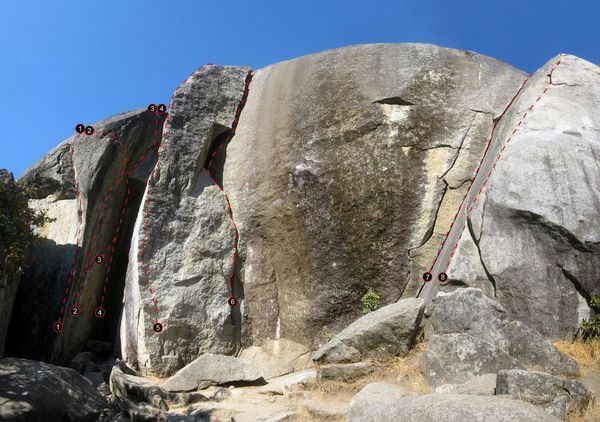 Some parties have reported lead climbing that feels like 5.7, with exposure. What to bring: Rock shoes, harness, helmet, belay device, three locking carabiners, PAS, cordellette, prusik, 2 runners, 2 non-locking carabiners, climbing pack, bivy, approach shoes / mountain boots, headlamp, sunglasses, personal items, layers, storm shell, map and compass, food, water, sleeping bag, pad, tent. We'll probably bring just one tent for the team. 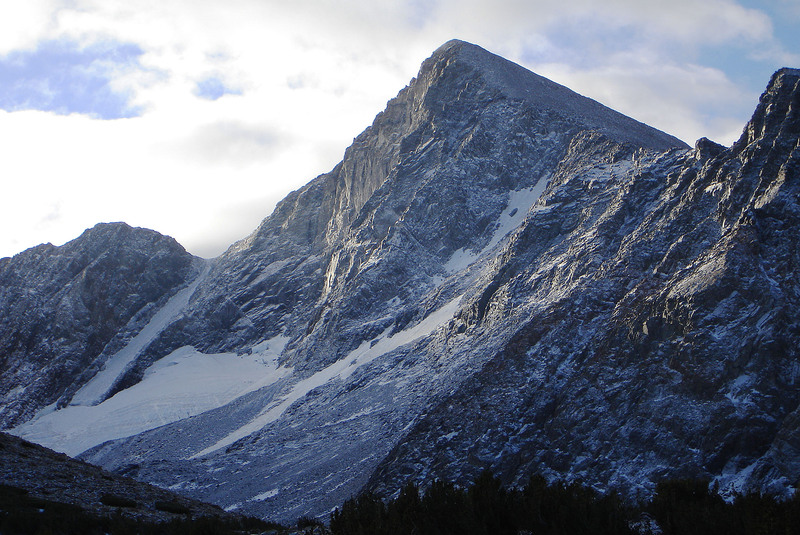 DAY 1, Friday May 17th: Meet in Lone Pine and hike up to the base of the North Ridge climb. Set up camp and prepare for the climb. DAY 2, Saturday May 18th: With a pre-dawn start and carrying light bivy packs, climb the north ridge to the summit, then descend back to the cars. The climb may take from 8-12 hours. The descent will take 4-5 hours. We will be returning in the dark. Join MAA members for a scenic snowshoe hike. 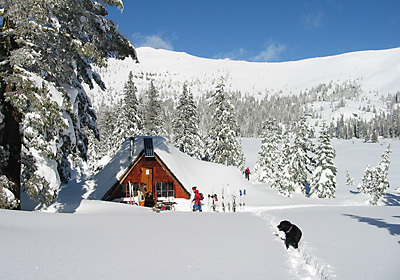 The Castle Peak and Basin Peak area is also home to the Peter Grubb Hut, our destination for the day. Come enjoy the alpine air and scenery with a warm fire at the end! Loaner gear may be available. We have room for 8. Hope to have you out with us! What's happening: Hiking or snowshoeing to Peter Grubb from near Boreal Ski area on I-80, near Truckee, CA. Approximately 3 miles each way, 500 feet elevation gain, mostly packed trail.